What exactly is an angel? They are obviously much more then only messengers of god, as the greece origin of their name implies and which is far better fitting to the messenger of the gods: Hermes. In the esoteric scene the "guardian angel" is most popular and well-known. Instead of a real angel most of the time your own ancestors are responsible for many incidents that are usually ascribed to the guardian angels. Silently over many years and only recently I am identifying my "power-animal" as an angel - at least she appeared more then once as one. An old friend of mine that is dowser never made any difference between angels and power-animals. I do not follow him totally on this, but for explaining the concept of the power-animal to a pious christian, this solution is working quite well. I consider angels as emanations of cosmic powers that are originating from far outside the Human-Time-Space-Illusion. They cannot be described with human terms, norms or morality. I think it is a good idea to meet angels with deep respect. Another friend of mine, Manfred Jelinski (a remote viewer) describes angels as "Technicians of Propabilities". He came to this conclusion after many RV-sessions in which angels appeared. They manipulate propabilities, repare them and run a kind of maintenance-service. Because it is so difficult to describe angels at all, his opinion is as valid as all the others. Angels can move freely between all possible propabilities as long as they are not stuck in a material base, as I do at the moment. I still can travel between the worlds, but I have to leave my physical body for this. Most interesting are the ideas early mystics wrote down on angels, as for example Dionysios Areopagita, Thomas of Aquin and Hildegard of Bingen. These ancient philosophers and mystics had some really interesting insights Matthew Fox and Rupert Sheldrake summarized and discussed in their book "The Physics of Angels. A Realm where Spirit and Science meet". There are a really vast number of angels in the universe, mindbogglingly many of them. The physical phenomenons and objects in space are (hosting?) an angelic intelligence and consciousness. In various Remote Viewing Sessions phenomenons like hurricans, objects like planets, suns and whole galaxies are being seen as actual living beings. . Not all viewers recognize this life-forms, but really many of them in fact do so during sessions with any of those objects as a target. Angels exist since the beginnings of the universe but there are also new ones born every day and other ones disappear or change their job. In traditional angelic-magic the angels are the ruling intelligences of nature - at last this detail can be verified by the RV-sessions nowadays. 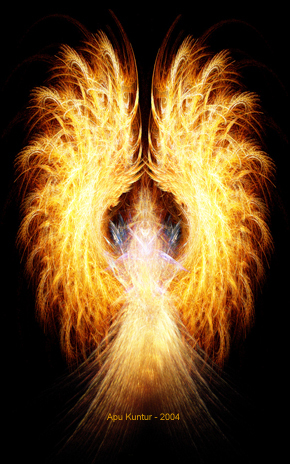 Angels have a special and direct relation to light, fire and the photons, quants of light - as beings of light. Angels are countable and can be quantized. This they share with the light-quants, the photons, but also their relative age-lessness, lack of physical matter and their movement in space. It seems that Thomas of Aquin had deeper insights into the cosmic laws and reality as it is asumed today. The angels are similar to physical fields as several angels can be at the same place at once - as it is the case with fields like the gravity-fields or electromagnetic-fields and so on that share all the same space but have different effects. The angels also are deeply harmonic and musical by nature. The Golden Mean springs into my mind, its relation 1,618 is resonating with the universal concept of love. As I already mentioned elsewhere that angels can be divided into three different branches. The constructive ones, positive by nature, the neutral ones and the negative ones, wicked by nature. The authors mentioned other characteristical attributes and specialities of angels but here is only one other of special interest. Angels are known to asume the gestalt of animals or humans occasionally, to influence the physical reality on a special and direct way. In the twilight angels appear to you in a shape and gestalt that meets your identifiers for the concept of "angel" you have in mind. Their appearance thus is in direct relation to your believes about angels and their appearance. They are organized in holarchic structures, that are folded hierarchies - or as I name them: natural hierachies. As an example I usually start with a single cell in a human body. This cell is part of the heart. The heart as an organ is part of the human body. This body is part of the life of the continent it lives on (and many other hierarchies and structures, as you know). The continent is part of the earth, the earth is part of the solar-system, which is part of a spiralic arm of our milky-way, which is part of a larger galaxy-cluster which itself is part of an even bigger structure that is part of the universe. All parts themselves host many holarchies within them and are themselves most complex objects, too. The structure of the angelic holarchy can be described with Heim's qualitative logic. The complexity of the holarchic structure increases with the lowering of the metroplectic totalities. These holarchic structures you can also find among the asiatic dragons, that are identified by their region of influence - so a river-dragon is on a different holarchic level then the dragon that rules the rivulet that ends in the river or the dragon of the ocean in which the river is flowing. The proverb that within each drop of water a dragon lives would point to a very low holarchic structural level, still visible, but very small.